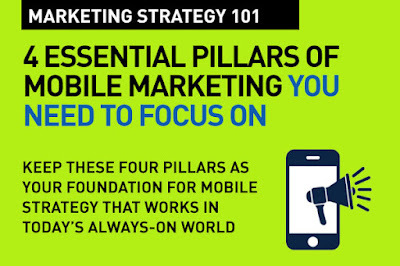 There are four essential pillars in any mobile marketing strategy. These are absolutely essential to keep in mind when building your mobile marketing campaigns and strategy. Every successful mobile effort by your brand, needs to accomplish some tasks. Some of these are focused on your audience – the consumer, other tasks may be business related. Through mobile, brands have the ability to be present at the exact moment a consumer is seeking a solution. Convenience is such a critically important pillar, that there's now a whole new genre in digital marketing called Convenience Marketing! Today consumers want simplicity and convenience, and mobile devices give them what they might want with fewer obstacles to disrupt their journeys. Mobile facilitates a quick and easy step from desire to action or acquisition. It instantly resolves problem and provides solution. Your brand must be there ready to at that micro-moment (as Google calls it). By being accessible, keeping things simple and direct, and providing immediate solutions, your brand will able to meet the consumer across those "I want to..." moments. Sure, you can be there whenever your audience is looking, but with what? Does your solution have true relevance? Does your mobile content genuinely provide a solution and relate to the need of the consumer? Mobile content needs to respond to consumer needs at the precise moment of desire – and instantly and effectively. So, if the mobile content you offer isn't relevant at first glance, game over right there. Build content that is relevant to your target audience's needs. Find out first what those needs are in order to do that. So, Customer Insights is your First Step in Digital Marketing. Mobile's uniqueness is location. Mobile offers unique possibilities to serve location relevant content and solutions to your audience. Marketers very often fail to focus on location. You should not create mobile content without a focus on this pillar. Your mobile strategy should focus on creating modular content that is tailored to meet your audience across multiple locations. This is what content in context really means. Do not forget the importance of location as context. Many mobile strategies are developed that ignore this important pillar. You can be relevant, you can be there in the instant, get right-place right-time done right, but you should not be intrusive. Most consumers hate being intruded on, when their journey is interrupted without their permission. As well, you need to make consumers feel secure that you respect their privacy and safety. The bonus of focusing on permission is that at some point you'll know through dialog and interaction, what they are expecting. These pillars are the foundations that you build your mobile strategy on. Read more on mobile strategy – links provided below. • Mobile Marketing: Native App or Responsive Website? Which one's right? Quick read, and very clear. These pillars of mobile marketing really drive everything else you build in to mobile strategy. Agree that marketers do not focus on the Permissions pillar and are into intruding and being disruptive of the whole experience. Thanks for the post. Great post. Wondering if another pillar is "integrated". Today, many brands do mobile marketing as a solo effort because of the focus on local, and immediacy. Seems like they forget that mobile cannot really succeed without integrating the efforts with all other aspects including online, in-store and social media. Thank you for sharing this and i hope this will be useful for many people.